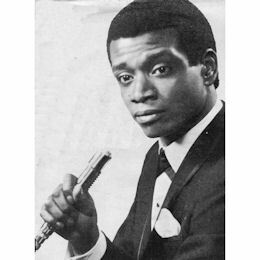 Al Gardner seems to have been born in Selma, AL but by the beginning of the 60s was in Detroit cutting the first of his small number of 45s for Robert West’s Lupine label. Sadly both “I’ll Get Along” and “All I Need Is You” were pretty much run of the mill uptempo cuts. His Sepia 45 goes for a lot of money these days and while the dancer “Sweet Baby” is OK “I Can’t Stand It” is considerably better, a pleasant beat ballad on which we get to hear Al’s rather Marvin Gaye flavoured vocals to good advantage. 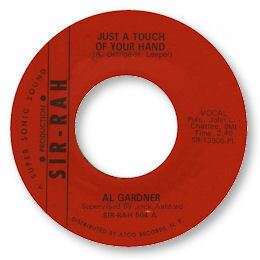 But the reason Al Gardner is featured on this page is due to his one-off 45 for Andrew “Shelly” Harris’ Sir-Rah label. Now I think it is pretty clear that “Watch Yourself” was cut in Detroit (how many times have you heard a tambourine/conga combination like that on a Memphis recording of the period?) but the brilliant Just A Touch Of Your Hand was certainly cut at Poppa Willie’s. And of course the maestro gets a superbly emotive performance from Gardner, quite unlike anything heard from him before. The song is a brilliantly melodic ballad and the way Gardner phrases it, his timing and use of dynamics is just sensational. It really does knock Paul Vann’s strong version out of sight. Perhaps the most interesting aspect of the release of this tune by Soul-Tay-Shus is the inclusion of a demo version by Don Bryant which uses the same rhythm track but doesn’t have the overdubbed strings. Don of course was a premier league vocalist himself but even he can’t get close to Gardner on this one. 1. Both sides of Gardner's Lupine 45 are on the fine Shout UK CD "Birth Of Motor Town" which also features 2 unissued tracks "Searching For My Baby" and "Baby Won't You Change Your Mind". 2. Both sides of the great Sir Rah 45 and the Don Bryant demo can be found on the Soul-Tay-Shus CD "Northern Souljers Meet Hi Rhythm". And on this occasion there is no need to warn you about the sound quality of this CD - makes a nice change. 3. The Al Garner who cut for Excello and Zynn is a different artist. Thanks to Pete Nickols for the suggestion.